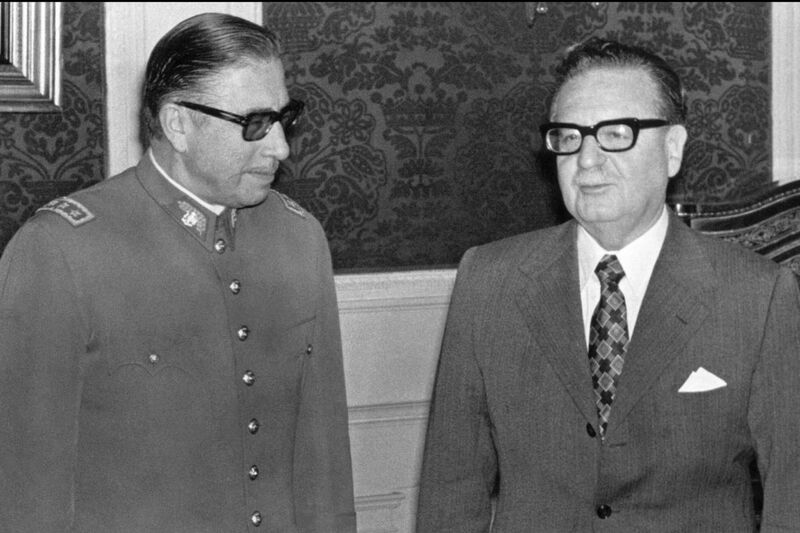 Gen. Augusto Pinochet (left) with Chilean President Salvador Allende in Santiago three weeks before the coup that overthrew Allende and put Pinochet in power for 17 years. I was living in Madrid in 1998 when the British shocked the world and detained former Chilean dictator Augusto Pinochet, wanted in Spain for questioning about crimes against humanity and the deaths of Spanish citizens on and after Sept. 11, 1973. That was the day a democratically elected president, Salvador Allende, was shoved aside in a violent coup d'etat and the general gained authoritarian powers for the next 17 years. By 1998, Pinochet was no longer a dictator but a protected senator for life who had traveled to London for back surgery. News of his arrest was splashed across the front pages of three major Spanish dailies. As a journalist on sabbatical, I naturally began to follow the headlines as the fight ensued over the question of Pinochet's immunity. BBC News ran a story written by a British national who had been living and working in Santiago at the time of the coup. He recounted how he had spent a week in the National Stadium and lived to tell the story of beatings, torture, misery, and death. He directly pointed to the United States as complicit. As a U.S. citizen, I began to feel a cloud of culpability descend on me; I wanted to learn more. Through documents and books, I began to find out about the U.S. activities in Chile, among them "covert actions" and propaganda, what the Russians today call "active measures" and fake news. A common form of propaganda was to develop an "asset" in the media, who would then write articles or editorials favorable to the United States or suppress news that was harmful. These stories were picked up by wire services and widely disseminated. The United States also subsidized a right-wing newspaper, radio broadcasts, pamphlets, thousands of cartoons, and paid advertising. In the 1970 election, the United States waged a "spoiling" operation as Salvador Allende ran for the presidency. The United States organized campaigns to create political polarization, distrust of government, and financial panic. Propaganda was used to sow dissent between socialists and communists who might support Allende. A scare campaign warned that an Allende victory would bring violence and Stalinist repression. Despite all that, Allende was elected president in 1970 by a plurality. President Richard M. Nixon declared the victory unacceptable and famously ordered U.S. operatives "to make the economy scream." It did. Striking truckers helped create economic chaos and were supported by private groups that received U.S. money. Food and commodity shortages ensued. U.S. aid, $35 million in 1969, was reduced to $1.5 million in 1971. The CIA fabricated information that Allende's people were working with Cuba to develop intelligence that would be harmful to Chile's army officers. It was the era of the "domino theory" and the U.S. did not want to see communism spread beyond Cuba in the Western Hemisphere. On the morning of Sept. 11, 1973, Chilean planes flew over Santiago, tanks moved through the streets, a curfew was imposed, and people began to disappear and die. Thousands of people were rounded up and taken to the National Stadium. Among those arrested was the beloved folk singer Victor Jara, who sang of the plight of the poor. When Joan Jara, his British-born wife, went to the stadium to claim her husband's body, she found that both his wrists were broken, his face was disfigured from beatings, and he had been shot 44 times. In 2014, I had the opportunity to visit Chile and the Museum of Memory and Human Rights in Santiago. The expansive archives there document the abuses of the coup and dictatorial regime that followed. In a country of 10 million people, 3,000 were killed and an estimated 40,000 tortured. As many as 200,000 raced into exile. The U.S. role in Chile has been cited as one of the worst examples of Cold War abuses. Human suffering was discounted, evil excused. Now we find ourselves in the midst of what has been called Cold War 2.0, and the tables have turned. We are looking at the possibility that our own presidential election may have been influenced by an unfriendly foreign power. Writing in the New York Times shortly after the 2016 U.S. election, celebrated Chilean author Ariel Dorfman noted the irony that the United States "is now crying foul because its tactics have been imitated by a powerful international rival." I realize the irony as well. The story of Chile stays with me. The human cost of our meddling haunts me. I keep telling myself, it can't happen to us. But can it?